A revamped and expanded Waterfront Park in Alexandria opened with a ribbon-cutting ceremony on Saturday, alongside an 8-foot-tall art installation that's sure to catch your eye. The new park is a key part in Alexandria's efforts to revitalize the waterfront along the Potomac River. Waterfront Park features an open plaza, waterfront promenade, shady refuges and multi-use space, the city council says. Alexandria hosted a public celebration on Saturday so residents and visitors could be introduced to Interim Waterfront Park, the combination of the former Waterfront Park and King Street Park. It's called the interim park because it will close in several years so the city can build flood mitigation infrastructure and more amenities before a permanent park can open, accounting to the city's website. A lighthouse-inspired interactive art piece also made its debut. "Mirror, Mirror" will be hard to miss: The 8-foot-tall, 25-foot-long open circle features surfaces that reflect its surroundings in unexpected ways, according to a press release from the New York-based designer, SoftLab. 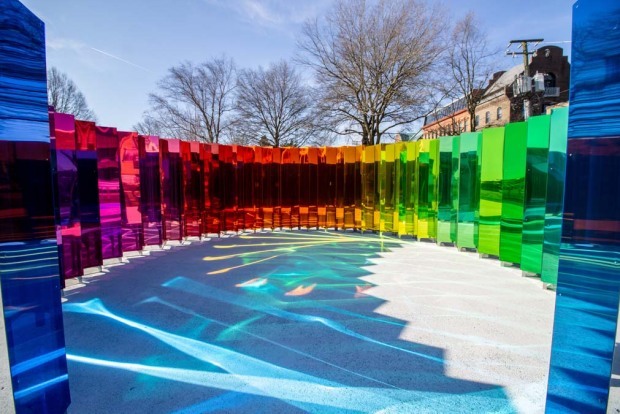 Visitors can enjoy the view from inside, seeing themselves reflected in a rainbow-colored "forest of light," the designer says. The artwork even responds to sounds with light, allowing visitors to see the work respond as they interact with it. Outside the circle also features mirrors meant to create a panoramic vision of Old Town and the river. 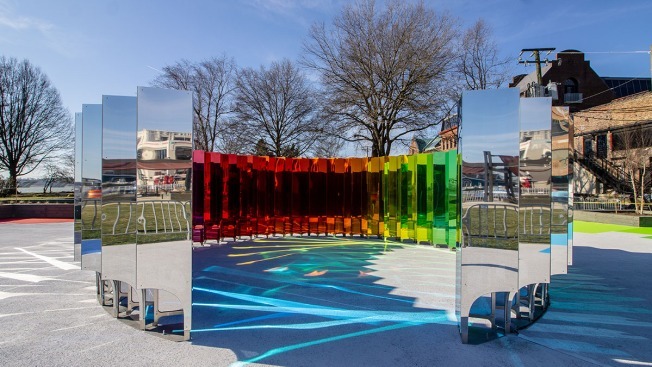 "We hope 'Mirror Mirror' will visually blend the waterfront, the fabric of Old Town and the activity of pedestrians in the new park," said artist and architect Michael Szivos. Music and movement performances will be held at the installation over the summer before it closes in November. "Mirror Mirror" is the first work of the "Site/See: New Views in Old Town" public art series which will showcase more contemporary art in coming months.